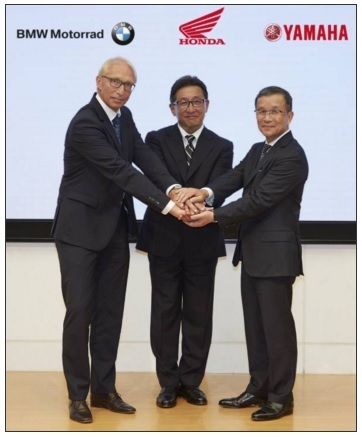 "In order to speed up more motorcycle-specific safety developments, we intend to cooperate to promote a successful implementation of C-ITS in motorcycles and scooters," says Tetsuo Suzuki, Operating Officer at Honda Motor Co.
Takaaki Kimura, Chief General Manager of Technology Center and Executive Vice President and Representative Director of Yamaha Motor Co adds "Our companies are already active members of Car2Car Communication Consortium. We came to realise that the specific requirements of motorcycles are beyond the scope of this consortium. This cooperation is dedicated solely to the challenges relating to PTWs." "Our aim is to promote a timely and comprehensive use of cooperative ITS systems in powered-two wheelers offering the potential to improve safety. We therefore encourage other companies to join us," explains Dr Karl Viktor Schaller, Executive Vice President Development BMW Motorrad.